Jo Austin has recently returned from the Hobbycrafts show in Glasgow and thought she would share this pretty card that she taught at the workshops with you. Around 350 people made this card over the four days they were there and a great time was had by all. The show itself exhibited lots of crafting trends from knitting and sewing, to quilting and card making... Lacework and tatting to jewellery and bags. An exciting eclectic mix of all sorts!! Method  Cut blue cardstock to 18cm x 18cm square. Cut your large heart from the centre.  Cut a piece of white cardstock to 17cm x 17cm square.  Stick the white layer on top of the blue layer and add to your card.  Cut out your second largest heart from the extra white cardstock. 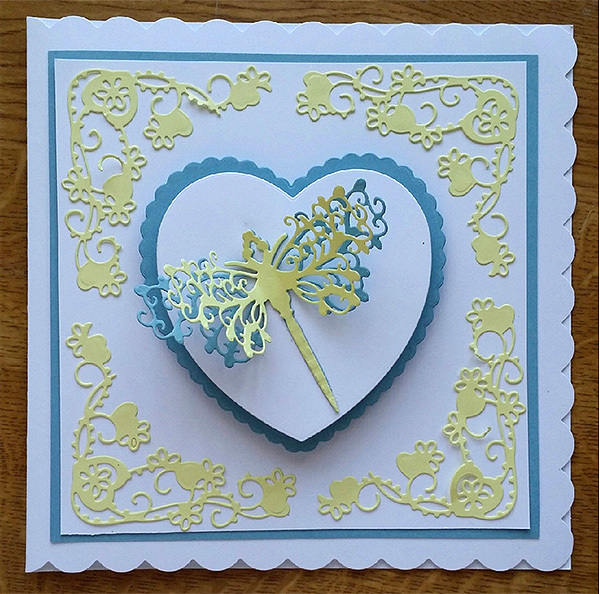  Cut your corners and the large dragonfly from yellow cardstock.  Cut a dragonfly from blue cardstock.  Attach your corners with glue.  Add 3d pads to back of the blue heart and white heart, stick centrally on your card.  Add your dragonfly to the centre of the heart to finish.